Circle Journals are a favorite in our family! There is something about waiting to get this special treat from someone in your family. It is also a great way to "give" throughout the year to each other. Some of my most precious "gifts" are the sweet notes and recollections from my kids' entries! I am attaching the instructions and a picture. I am "in between" computers right now so I will give detailed pictures at a later time. When available, I can post the video from Good Things Utah, it will give the best explanation for you anyway! 1. Cut 2 pieces of fabric to be the height of your composition book (they all measure differently) plus .75” and the width would be the width of your composition book all the way around plus 10”. 2. Sew the 2 pieces of fabric together right sides together leaving a small hole in the side. 3. Turn the fabric right side out. 4. Fold the edges of the fabric in on each side and top stitch around the edges of the fabric. When you get to the part you left the hole, tuck it in so it looks like the rest of the fabric. 5. Put the cover over your book. 6. Use the Imaginisce i-top to make a custom fabric brad. Wrap the ribbon around the journal and secure on the front and back cover with the brad. 7. 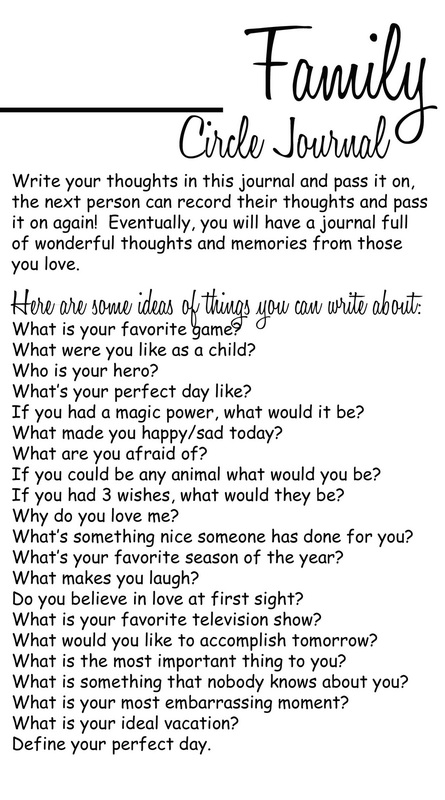 Glue your journaling ideas in the inside cover (optional)… these can be found on my blog. 1. Sew together the strips of fabric. 2. Cut the strips to be the size for your composition book. You will want to cut them to be the height of your notebook plus an additional .75” and the width would be the length all the way around the book plus an additional .75”. 3. Cut 2 pieces of your solid colored fabric to be 5” wide and the height of your composition book plus .75” and one other piece of your solid colored fabric to be the height of your composition book plus .75” and the width would be the same length of your strips fabric plus an additional 9.5”. 4. Sew the 5” panel of fabric to the side of your strips fabric with a ¼” seam. 5. For the back side of the book, sew the 5” panel to the side of the strips fabric. Put your elastic in the middle and sew back and forth over it 5 or so times to keep it sturdy. 6. Now, sew the long piece of fabric to the other piece right sides together, leaving a small hole on the side so you can turn the fabric right side out. 7. Turn fabric right side out and iron it. 8. Top stitch the entire top with a 1/8” seam, sewing the sides of the cover in to create a flap. As you do this, you will tuck in the small spot that you had left open. 9. Use the Imaginisce i-top medium brads to make a custom fabric brad. Place it on your cover and use the elastic to close your journal! 10. Glue your journaling ideas in the inside cover (optional)… these can be found on my blog. And, if you are like me and NOT a seamstress… you can do a duct tape journal! Simply cover your journal with Duct Tape. There are so many different kinds at the store and your kids will love helping you with this. Here it is in it's original size. For a PC, click on the image so it appears in it's own window and then right click and save it to your computer to print. For a Mac, click on the image and when it appears in it's own window, drag the image to your desktop! 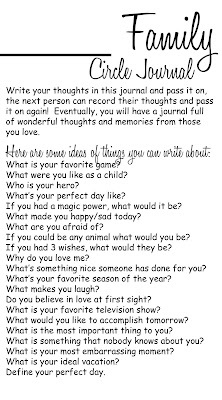 You will start this journal by writing an entry. Then, you will leave it for another family member (we like to stick it on their bed). They write on it and leave it for the next person. What a great idea for keeping up with family members. I love it.